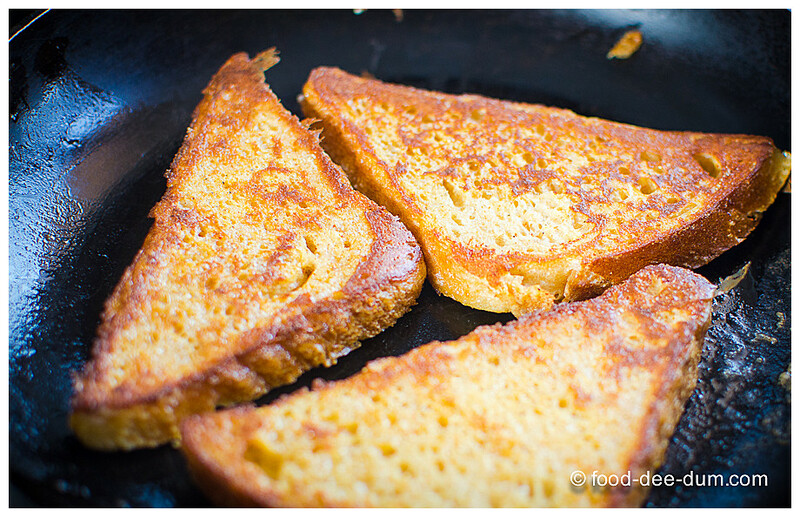 For as long as I can remember, French Toast has been a savoury dish in our home, the way my mother made it. The fact that it is universally served with maple syrup or powdered sugar and fruit is a concept that I only learned as an adult. 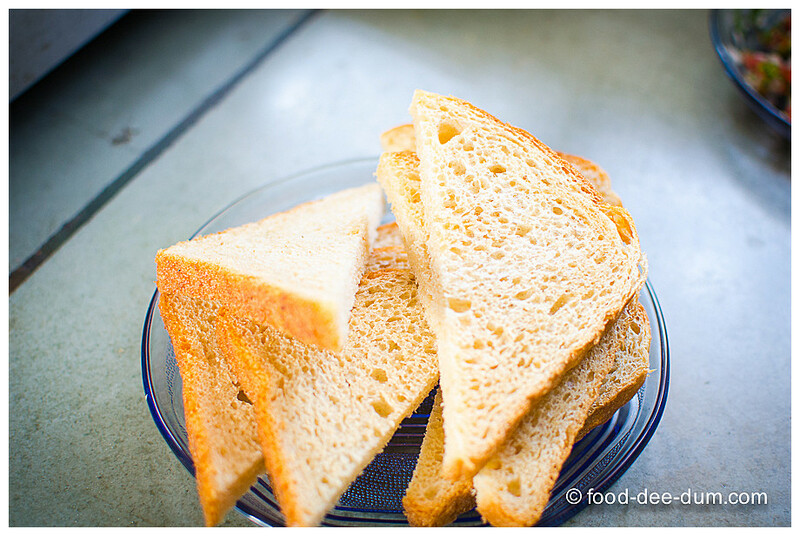 There’s an Indian version called Bombay Toast, but the term seems to have been more popular in the West and South of India because I never heard about that either. Or maybe I just wasn’t as aware of food as I like to think I was. 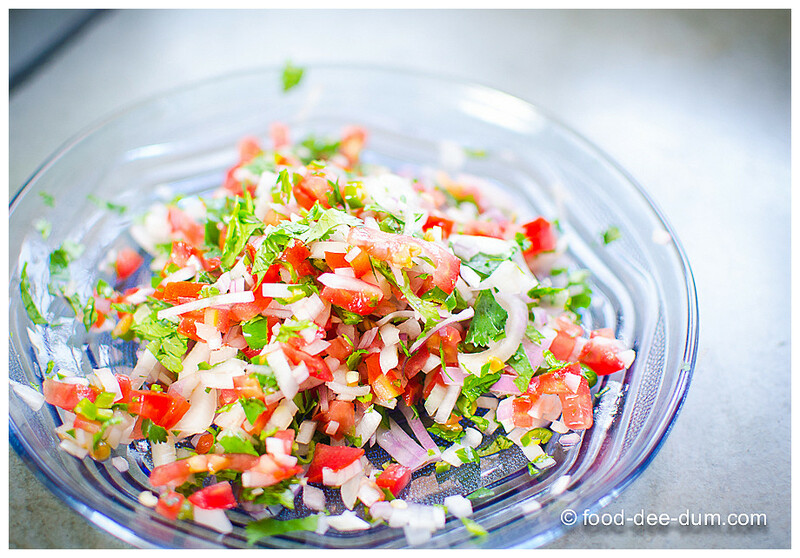 Or maybe my mom’s version was so satisfying that it never occurred to me to look beyond it. 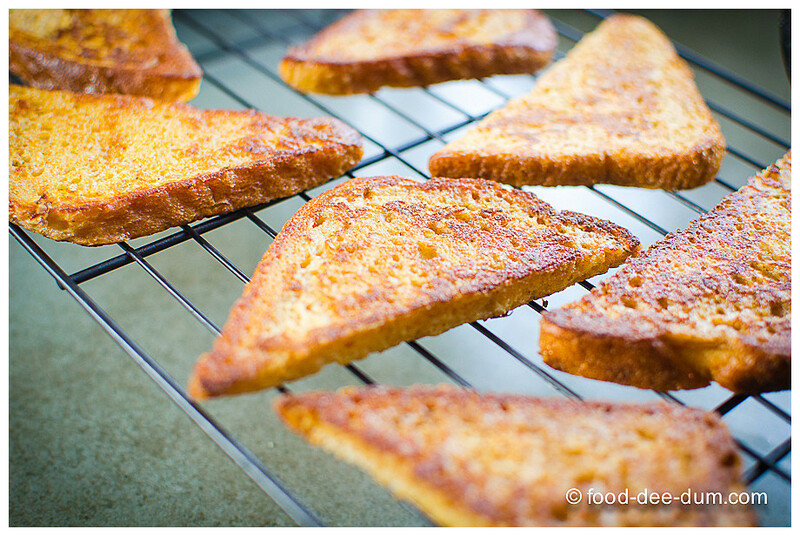 Anyhow, my version of this globally popular egg-and-bread dish known by many names — French Toast, Bombay Toast, eggy bread, gypsy bread, pain perdu and many others – is spicy and crunchy. 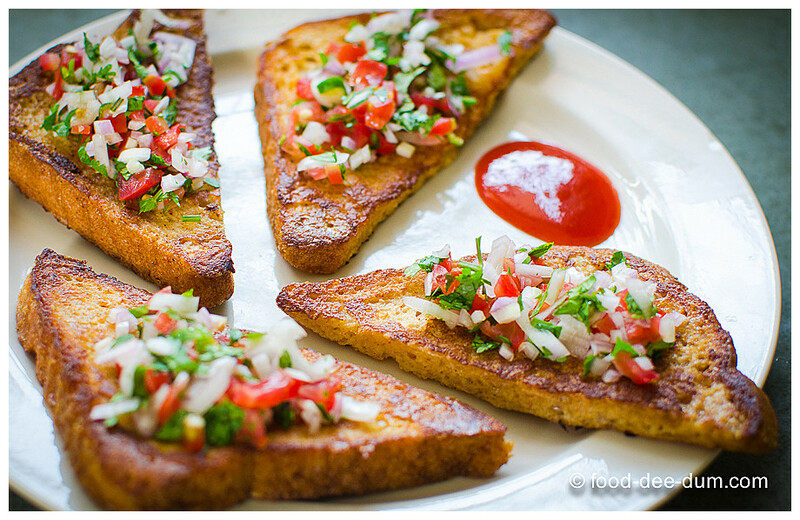 Hence, the name Masala French Toast. 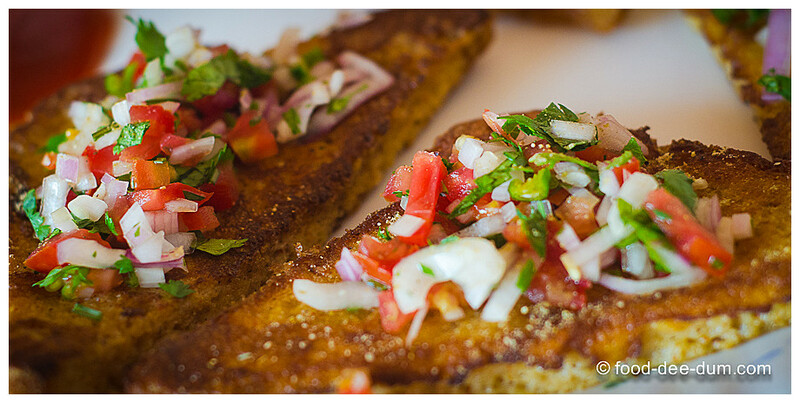 It can be served with ketchup or green dhaniya-pudina chutney, or a combination of both. The permutations and combinations for the toast itself, as well as the accompaniments are endless. 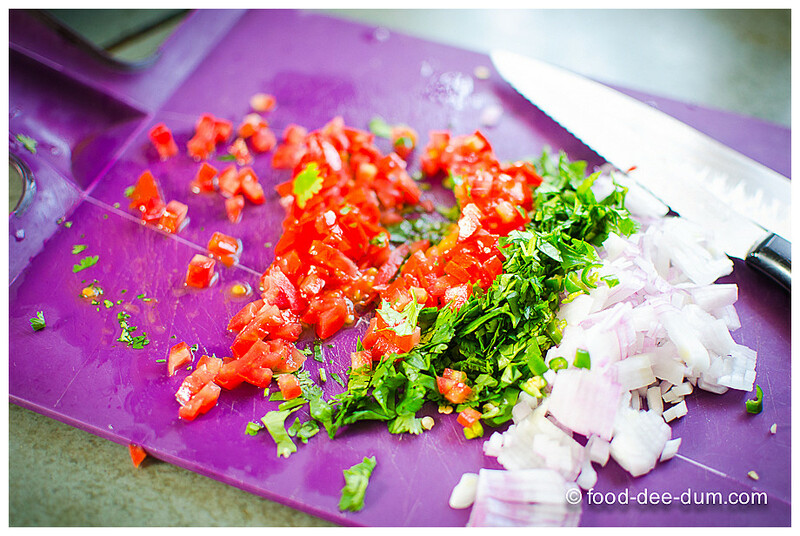 Got the topping ingredients together – onion, tomato, green chilly and cilantro. Chopped them up finely, mixed it all up and kept it aside while I got the toasts ready. I cut the bread slices into half, diagonally, ending up with 8 triangles. You can make them rectangle, square, smaller or bigger — like I said, endless possibilities. 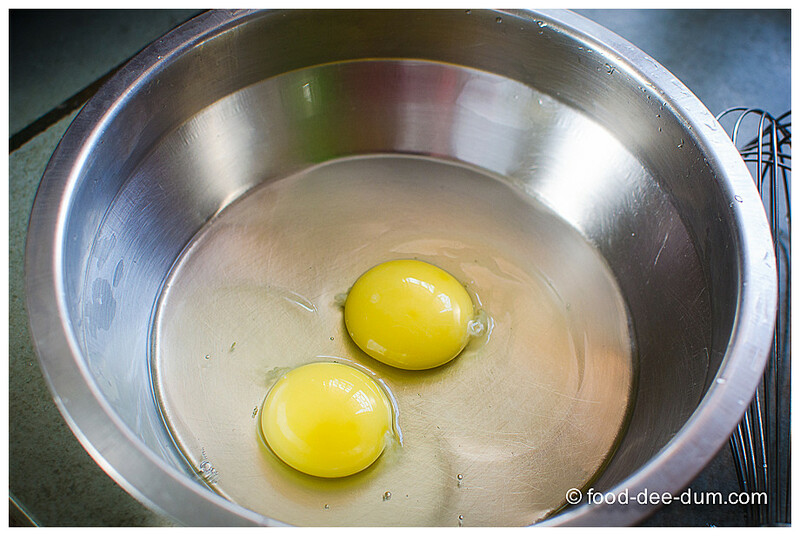 I cracked the eggs into a mixing bowl with a flattish bottom, which makes it easier to handle the bread. 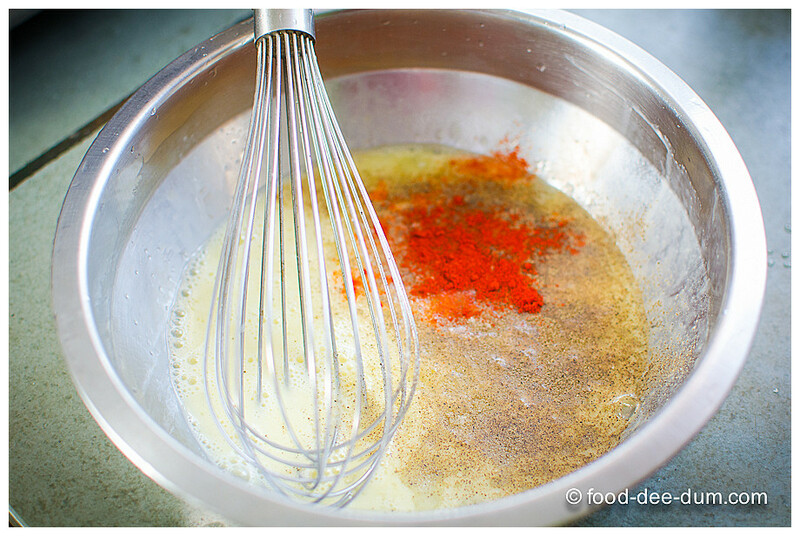 Beating the eggs, I added the milk, salt, red chilly powder and black pepper powder before mixing again. 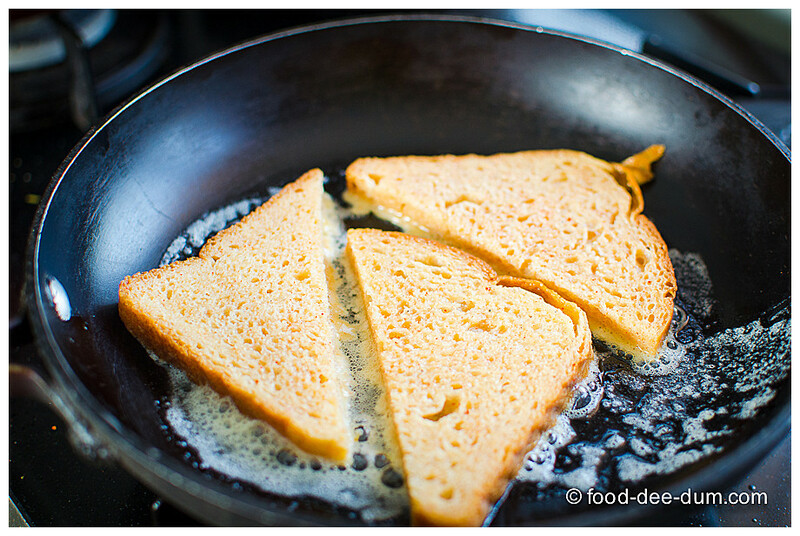 I melted a little butter in the skillet on medium-high heat and paralelly dipped 2 of the bread triangles in the egg-milk mixture, carefully flipping it once with my hands. Once both sides were coated, I lifted them out and placed them on the hot skillet. I was using a medium sized one so I could comfortably fit 3 triangles at once. I flipped them over carefully so that both sides could be browned evenly, about 1.5 minutes on each side. When both sides were done, I lifted them out and placed them on my wire cooling rack. You can do the same or place them in a plate lined with a few kitchen paper towels. 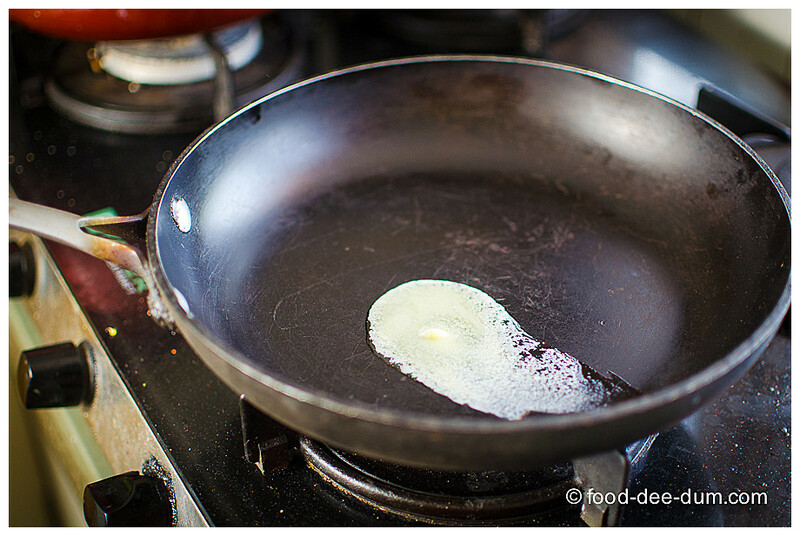 If you place them directly on a plate without lining, then they will get soggy while you fry up the rest. 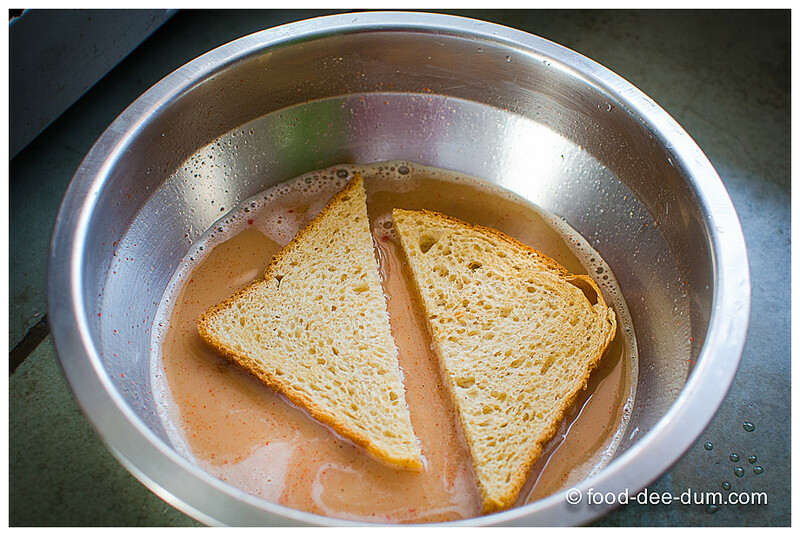 I continued to dip, soak and fry the remaining bread in batches until all of them were done, adding little more butter to grease the skillet before each batch. Also, whisking the eggs a little before each dip helps because the pepper tends to settle at the bottom. 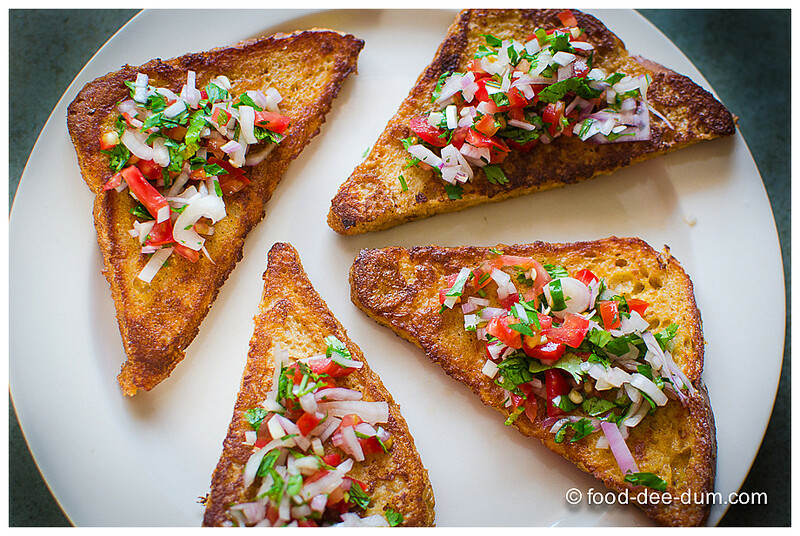 When they were all done, I arranged 4 triangles on a plate and topped them with a generous helping of the onion-tomato “masala” and an even more generous sprinkle of chaat masala! Some ketchup and we’re good to go. I told you — quick, easy and delicious. Perfect for a light snack, a heavy breakfast or even dinner for an egg-loving individual like AK. 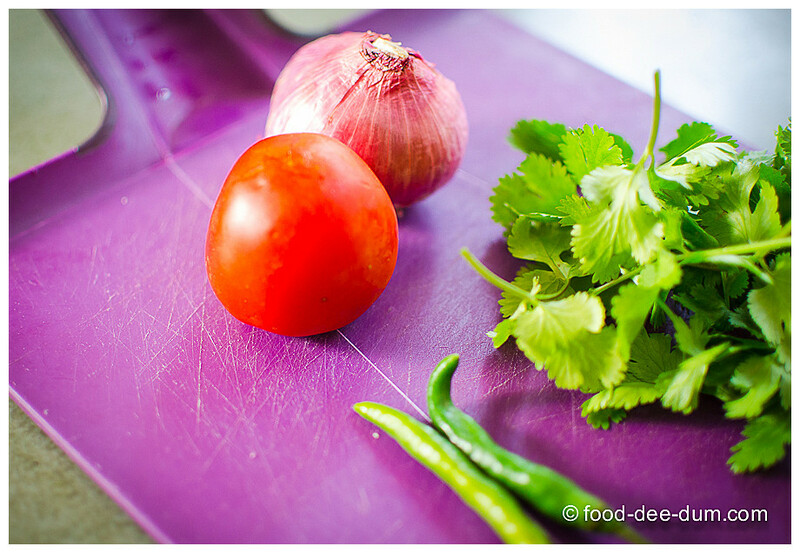 This recipe has also been featured in Archana’s Kitchen.